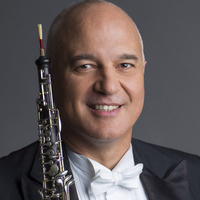 Recognized as one of the world's leading oboists, Grammy-award winner Alex Klein began his professional career at age 11 in his native Brazil. He was Principal Oboe with the Chicago Symphony under Daniel Barenboim until 2004, leaving the position due to the onset of Musician’s Focal Dystonia, but returning to the CSO under Riccardo Muti in 2016 in a continuing effort to suppress the consequences of the disorder. Klein won the First Prize in the Geneva International Competition, the New York International Oboe Competition and the Fernand Gillet International Oboe Competition, winning top prizes in the Tokyo and also the Prague Spring International Oboe Competitions. Klein performed as soloist with the Chicago Symphony, Philadelphia Orchestra, Orchestre de la Suisse Romande, the Belgrade Philharmonic, Czech National Symphony, Porto Symphony, and orchestras in China and Latin America. His recordings include concertos written specifically for him by Yano, Sydor, and most recently David Stock, and are released by Teldec, Boston Records, Newport Classics, Musical Heritage Society, and Cedille Records. His master classes are held at the world’s top music conservatories such as the Juilliard School, Eastman, Oberlin, Northwestern University, Paris Conservatory, North College of Music in Manchester, Geneva Conservatory, Glen Gould School in Toronto, Central Conservatory in Beijing, the Tchaikovsky Conservatory in Moscow and the Rimsky-Korsakov Conservatory in Saint Petersburg. Klein has adjudicated international competitions in Japan, England, Russia, Switzerland and in the USA. After departing the Chicago Symphony due to the onset of Musician's Focal Dystonia, Klein diversified his music career to perform chamber music, recordings and as a soloist, adding also conducting and music administration to his activities, aiming to accelerate the development of musical artistry in Brazil and Latin America. Klein founded and is Artistic Director of FEMUSC - Santa Catarina Music Festival, which quickly rose to become Latin America's largest music festival, and served as founder and General Director of PRIMA, the Program of Social Inclusion though Music and the Arts, establishing youth and children's orchestras in the public school system of the Brazilian state of Paraiba, beginning with the areas hardest hit by social risk. Alex Klein has been a faculty member at the Oberlin Conservatory of Music, the University of Washington, Northwestern University and Roosevelt University. He now joins the faculty of DePaul University. His former students have won auditions to join the orchestras of Denver, Dallas, Qatar Philharmonic, Shanghay Symphony, Kansas City Symphony, San Francisco Opera, Santiago Philharmonic, Mexico City Philharmonic, and many others. Standard: $15 / DePaul Faculty & Staff: $5 / Students: $5 / Additional fees may apply.